It’s not often I find a candy maker in my neck of the woods. North Carolina isn’t exactly exactly the candy-making capital of the world. One of my wife’s co-workers found out about Candy Addict and convinced his friend, who has a business making chocolate truffles, to get a batch to me to review. This friend runs Azurelise. The story of Azurelise is an interesting one and well worth a read at the Azurelise website. Basically, a tenured associate professor in Philosophy abandons teaching and decides to make chocolates (there’s more to it than that, but that’s the basics). What I have before me now are Azurelise chocolate truffles, made by this former Philosopy professor. The truffles aren’t your ordinary fancy, embellished truffles. These look, in fact… ordinary. They are approximately 1.25″ x 1.25″ x 0.5″ – they have no fancy flowers on them or swirly-q or anything else. Just a simple plaid pattern and the word AZURELISE diagonally across them. I received five dark chocolate truffles and four milk chocolate truffles. The milk chocolate is wonderful. The chocolate has a good thickness to it and is nice and smooth. The center plays well with the milk chocolate in a plain, but delicious, chocolate sort of way. The dark chocolate has a definite dark chocolate bite to it and if you like dark chocolate you should love this. Like the milk chocolate, the outer shell of the dark chocolate is nice and thick and also plays well with the truffle center. 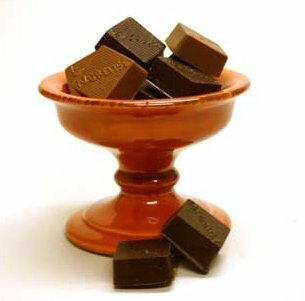 I have always preferred milk chocolate over dark chocolate and it holds true again with the Azurelise truffles as well. Both the milk and dark chocolate truffles are excellent and I can give them both a hearty two thumbs up. Azurelise also makes many other chocolates like “Dark Chocolate Classic Chocolate Truffle”, “Milk Chocolate Classic Chocolate Truffle With Pecan”, “Dark Chocolate Raspberry”, and the intriguing “Dark Chocolate Genius Truffle (featuring Guiness Extra Stout)”. mmm, truffles are the best type of chocolate. especially ones with crisped rice in them. being irish, i should probably be into the idea of the guiness ones but i hate the taste of alcohol! I would definitely try a Guiness Extra Stout one, especially since it called a “Genius” Truffle! Chocolate is supposed to make you smart, but chocolate and beer mixed = GENIUS! antfan, it’s also supposed to make your hair shiny if you wash with it!